Paris has never really been on my bucket list of places to go. Honestly, I felt it was an overrated place with just exceptional tourist marketing. Let me tell you… I get it now. I understand. I’ve jumped on the Paris bandwagon after my visit! City explorations of course have to do with what the city has to offer, but let’s start off with a disclaimer: Paris was absolutely luxurious for me. What was the icing on the cake? Staying once again with the Sofitel chain. This time, we were at the Sofitel Paris Baltimore (Tour Eiffel). You all know that I like to mix up my travel styles between budget to mid- to 5-star accommodations. But when in Paris, we had to indulge. As the name suggests, this hotel brings you close to the Eiffel Tower. While it is still quite some walking distance away to the tower itself, just down the block is Trocadero. This means a few things: 1) you’re close to the metro, and 2) you get outstanding views of the Eiffel Tower! Photos of this will be in my Paris blog post – stay tuned! 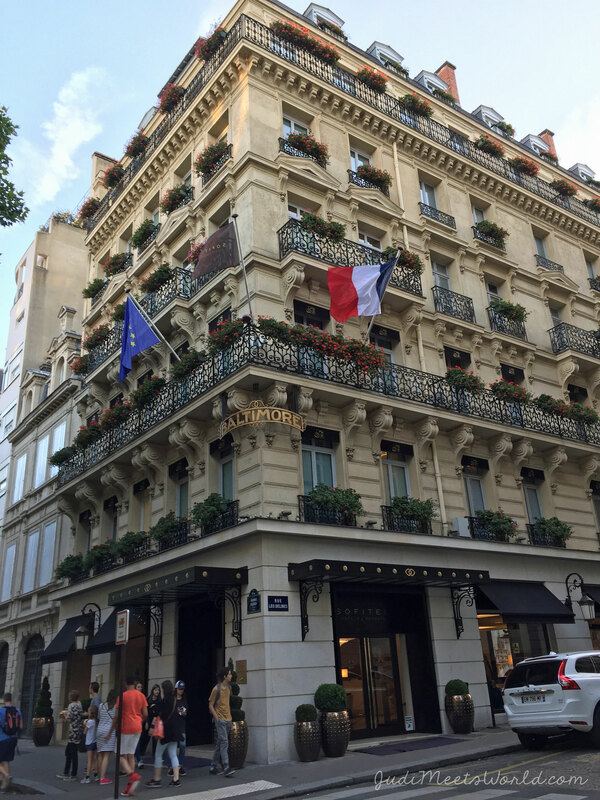 The Sofitel located at 88 Bis Avenue Kleber right in the heart of Paris. You are walking distance from both Trocadero in one direction and the Arc de Triomphe in the other. Being so close to public transportation also means that the city is yours to explore for minimal cost. 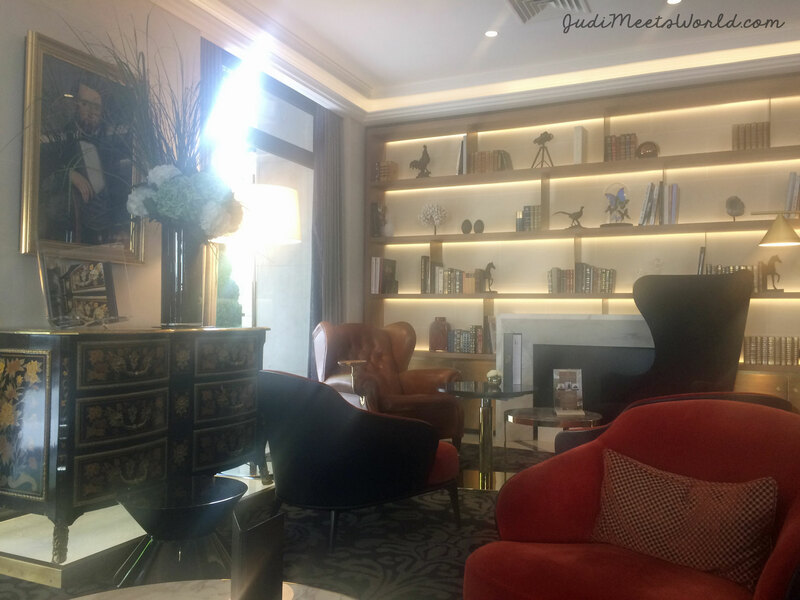 Walking in, there’s a beautiful sitting area in the lobby with all the extravagant types of furniture that one can expect from Paris. We had arrived super early so we were able to sit and enjoy, with some welcome drinks, before checking in our bags to storage so we could explore the surrounding area for lunch. We stayed in a deluxe suite with 2 double beds. Our suite had a beautiful desk area facing the windows which really let the sunlight in. 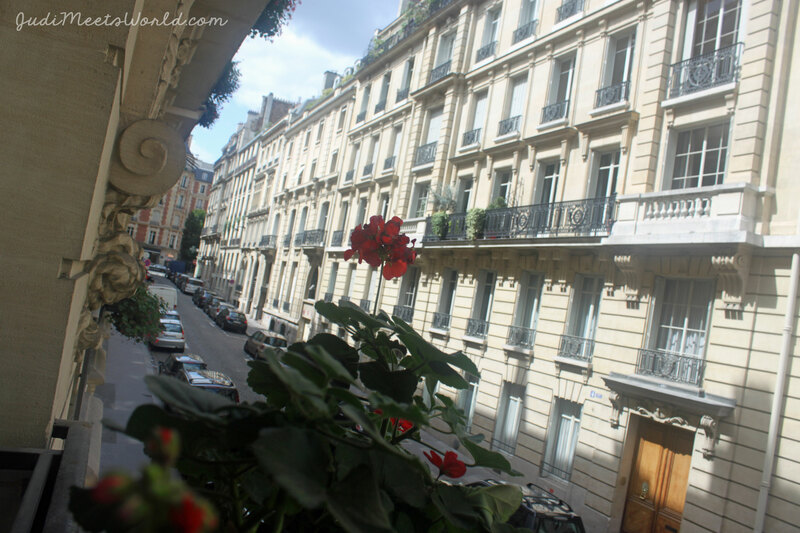 The view out of my window included dainty little flowers with the background of Juliet balconies and Parisian architecture. That’s something I could get used to for my morning routine! There was a sitting area with a desk tray, complete with a book all about Paris. The bathroom was decked with Hermes toiletries and a rain shower head. In the room was a Keurig-like coffee machine with vast options to choose from. Complimentary breakfast is served daily by the lobby, with a generous selection of pastries and hot breakfast items. Croissants, breakfast muffins, tarts, and fresh fruits. I was a happy camper! The staff also serve eggs to order, as specific as you want them. When in Paris, make sure to try ALL. THE. CHEESE. I can’t begin to tell you the amounts of fromage I indulged in during this visit – perhaps the key reason why Paris sits so dear in my heart. The stairwell by the breakfast room will lead you down to the fitness centre with a full-body weight system and cardio machines. There are also personal trainers for hire. At this point, I knew my step count is double my daily goal, so I knew I’d stick to the natural cardio that comes with exploring on foot rather than spending time in the hotel gym. Anyone doing business on their trip to Paris, there is also a business station on hand – good if you need a quiet, well-connected space other than your hotel room, with fax/printing options. As someone who travels with a range of experiences, I don’t regret going the luxury route for my first experience in Paris. 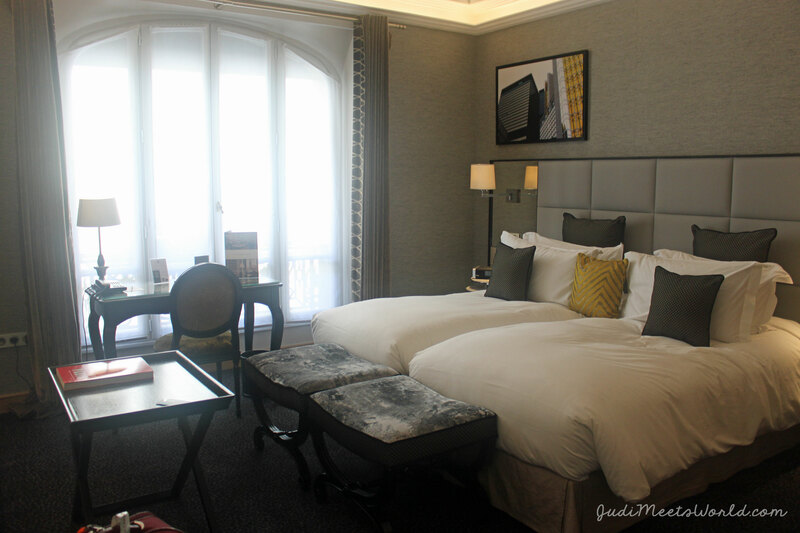 Coming home to the centrally-located Sofitel, having such decadent options for toiletries, then resting in such a comfortable bed were well worth the splurge. An example of the exemplary service: we needed to leave early to catch our flight to our next destination, meaning we would miss our complimentary breakfast. We let the staff know the day before, and they were generous in preparing a to-go bag of goodies for us, asking which items we preferred from their breakfast spread. 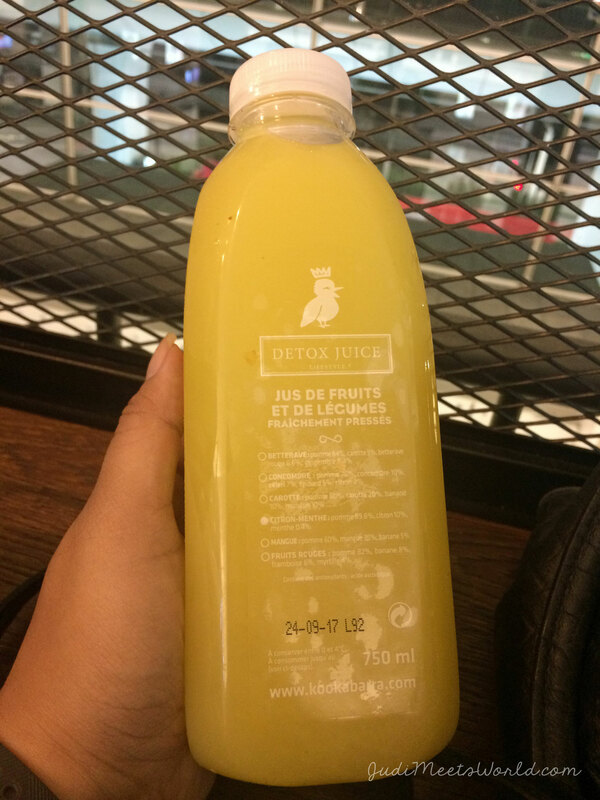 I definitely appreciated this gesture, and was thrilled to be able to take one of their cold-pressed juices with me to wake me up on the ride to the airport. Thanks, Sofitel! 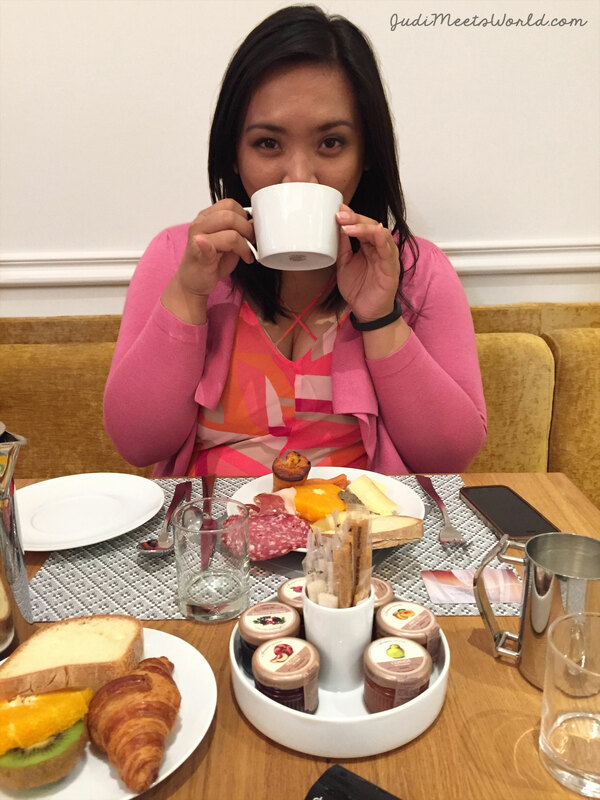 What is your go-to accommodation for Paris? Where should I stay on my next visit? Connect with me – let me know!